Natural Rubber or Silicone Rubber? Natural rubber or silicone rubber? In the world of lost wax casting, this question is hardly an academic one. The mold material chosen must be up to the task of turning a single original model into hundreds or even thousands of wax models for casting, and choosing the wrong material can lead to some serious hair-pulling in the casting department. There are actually three primary categories of rubber mold making materials: natural rubber, vulcanizing silicone rubbers, and room temperature vulcanizing (RTV) rubbers, a non-shrinking, no-heat option. Each has its advantages and disadvantages, and as a result, each may be the best choice in certain situations. The key to choosing between them is to understand the properties of all three, and then decide which to use based on what qualities are most important for a given situation. Natural rubber’s advantages include high tear and tensile strength and a long shelf life. As the industry standard for decades, it’s also a more familiar material to many mold makers. Tensile strength is commonly measured by the number of pounds per square inch (psi) required to tear a standard sample. Natural rubber can withstand up to 3,000 to 3,500 psi, while silicone rubbers can handle 1,000 to 1,400 psi. RTVs are the most prone to tearing at 100 to 200 psi. This greater tensile strength means that natural rubber molds normally last longer in production situations. While natural rubber molds may be used thousands of times before deteriorating, silicone molds typically withstand hundreds of uses, while some putty-type RTVs may be usable for only 10 to 30 waxes. Although natural rubber was initially less expensive than silicones, the price of vulcanizing silicone rubber has dropped and the two are now nearly equal. RTVs, however, remain more expensive than either natural rubber or vulcanizing silicones. Since its introduction to the jewelry industry, silicone has been making steady inroads into the mold maker’s shop. The material’s advantages include a higher-quality surface finish and easier release of wax models, as well as the availability of RTVs. Because silicone rubber molds are self-lubricating, they don’t require the use of spray release agents, reducing problems caused by the buildup of these agents on the molds. This property also makes it easier to release intricate, detailed designs from silicone rubber molds on the first try, versus the tinkering occasionally required to get the right amount of release agent in a natural rubber mold. Some users find that silicone rubber holds its shape during wax injection better than natural rubber, making silicone more tolerant of variations in injection pressure. Also, silicone rubbers typically produce less flashing, since seals can be tighter. Silicone’s putty-like texture makes it easier to pack a mold, since there’s no need to cut the rubber to size, and it is also easier to cut. In addition, different hardnesses of silicone rubber can be combined in a single mold and vulcanized together. Silicone rubber’s higher heat resistance makes it suitable for casting metals with melting points of less than 315°F (157 C), such as pewter and tin, directly into the mold. Silicone rubber also has a higher vulcanizing temperature than natural rubber -330°F (165 C) to 350°F (177 C), compared to 310°F (154 C) for natural rubber. 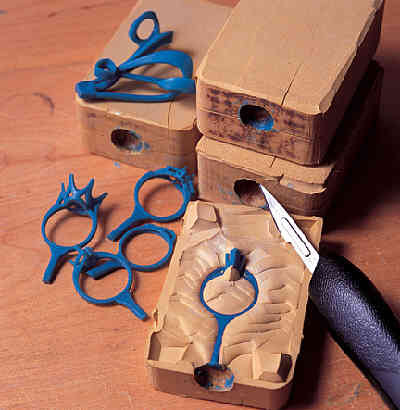 A third option for mold making is the non-shrinking, no-heat RTV rubber. These two-part mold material is typically mixed and poured around the model, then allowed to cure for 18 to 72 hours. Clear liquid RTV silicones also provide greater ease for inexperienced mold cutters, since the mold maker can see the model through the silicone rubber. On the downside, RTVs usually have significantly longer curing times – hours or even days, compared to 45 minutes or less for natural rubber and vulcanizing silicone molds. They also offer the lowest tensile strengths of all the common mold materials, and require careful cutting and gentle use to avoid damaging the mold. Many RTVs must be mixed in precise amounts, and the working time for the molds is often quite short at just a minute or two, although there are some RTVs that offer work times of up to 60 minutes. Most liquid RTVs require vacuuming to remove air bubbles, as well. Whatever your choice for mold making, you’ll need to use the right tools and techniques to get the best possible results. When cutting molds, be sure to use a sharp blade, and replace it immediately if it gets nicked or dull. Make sure that your hands are clean, and that the model has no visible defects. If you are using a vulcanizer, double-check the accuracy of the vulcanizer’s temperature gauge with a thermometer. Check each plate separately by placing a block of scrap wood into the vulcanizer, and sandwiching the thermometer first between the wood and the top plate, and then between the wood and the bottom plate. Observe the temperature variation through the vulcanizer’s entire heating and cooling cycle. And whatever mold material you use, be sure to follow the manufacturer’s instructions precisely. While some materials are more forgiving than others for variations in process, all will offer better consistency and predictable results if you follow the steps the manufacturer has outlined for it. So what type of rubber should you choose? The question doesn’t have a single answer, and with technology improving all the time, the answer you come to today may not be the best one for tomorrow. Natural or silicone? The choice is yours.